Hanging artwork and mirrors correctly can be more important than the artwork itself. Properly displayed, artwork and mirrors can enhance a focal point, an architectural detail, or serve as a focal point itself. A piece of art can stand alone or be grouped with other pieces for greater impact. Artwork should harmonize with the interior design, architecture, and colors in your home. If you're timid about pounding nails in your walls, or live in an apartment or dorm that doesn't allow nail holes, see leaning pictures and mirrors for home decorating ideas on other ways to showcase your favorite pieces. 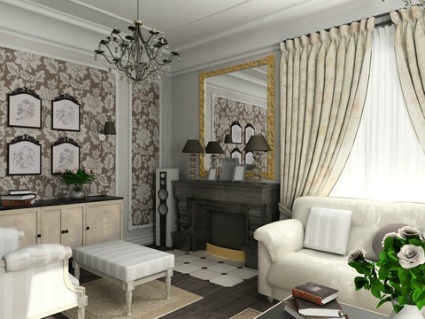 Place all the elements of a room, (furniture, area rugs, lighting, draperies) before hanging artwork and mirrors. 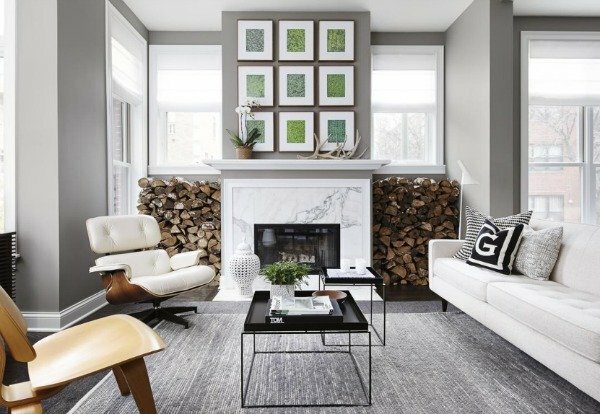 These home design elements will guide you in the proper placement of your artwork. See home interior design rules. Before you pound one single nail, stop and consider what kind of walls you have. Sheetrock, brick, plaster? Follow this helpful link from Canvasvows.com for great wall hanging tips! Small rooms: hang wall groupings 2-4" apart. Large rooms: hang wall groupings 4-6" apart. The width of your hand, fingers closed, can often serve as a spacing guide. The space between artwork and the top of a sofa can be about 6-10 inches. If the space is too wide, your eyes will be drawn to the gap instead of the picture. The space between artwork and the top of a table can be about 10-12 inches. Notice how the fireplace is about 2/3 the width of the fireplace? When hanging artwork and mirrors in wall groupings, odd numbers are more visually appealing to the eye. See art of accessorizing for more on this. Landscape art and mirrors are perfect for small spaces. Landscapes indicate depth, causing your eye to be drawn into them in the same manner as a mirror. We're told to hang our artwork at eye level, but since people come in all sizes, this isn't reliable. As a rule, the middle of a piece should measure about 60 inches from the floor. Stagger your artwork (one piece higher than another) on staircases, cathedral walls or places where the wall has a lean-to pattern. Below is an instructional video by Susan Phillips who discusses how and where to hang art. Picture frames should be consistent with the style of artwork that you’re framing. For contemporary artwork, look for black, lacquered wood or sleek metal frames. 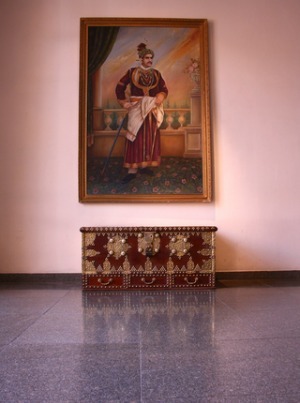 For traditional artwork, look for elaborate frames made of wood or brass. Color should be considered as well. Frame colors should complement or flatter, but not compete with the paint colors in a piece of art. Matting is another option to use when framing pictures. (Not for oil paintings, though.) Matting is made of cardboard and placed between the glass and the artwork. Matting should complement certain colors in the picture. You can find mattes in any color, but try to pick a color that contrasts with the wall-- this will make your artwork stand out. Affordable matting can be found in standard sizes at Fred Meyer, Walmart, Target or any arts and crafts supply stores. Use the same color of matting in wall groupings to unify them. This portrait is too wide in proportion to the chest below. Also too "taste specific" for home staging. When hanging artwork and mirrors over a sofa, fireplace, or table, the piece should be about 2/3 to 3/4 the width of the furniture below. This rule of ratios, called the "golden section" rule, is explained on my art of accessorizing page. See how the oil painting to the right doesn't follow the golden section rule? The large painting is proportionately top heavy and appears to loom over the chest. In addition to being unbalanced, the style is also too "taste specific" for home staging. If you're trying to make a home sale, avoid this "museum-like" style, since it won't appeal to very many house hunters. When hanging artwork and mirrors, the pieces should be large enough to be noticed against the feature that it's hanging above, whether it's a fireplace, sofa or console table. In addition, it should also try to mimic the shape of the object or detail that it's complimenting. For instance, a long rectangular shaped object like a sofa should be complemented by a piece of art or mirror of the same rectangular shape, or a grouping of paintings or mirrors arranged in a similar shape. Wall groupings are typically smaller pieces of art that are related in some fashion; by their frame, theme, style, color, size or material. Like single pieces of art, groupings placed above furniture or fireplaces look more cohesive when they imitate the shape of the feature below. 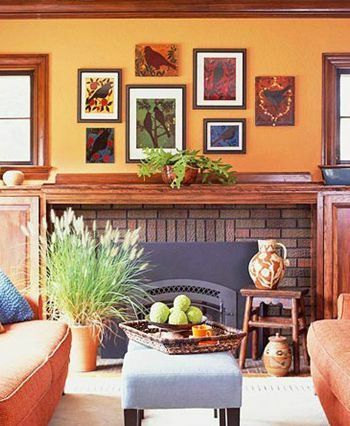 For example, four pieces of art could be arranged in a square to match a square shaped fireplace below. Likewise, artwork could be arranged horizontally over the rectangular length of a sofa. Follow the same proportional ratios (golden section) with wall groupings as you do with single pieces of art; 2:3, 3:5. This home decor style works well in formal room design, which is based on symmetry and vertical lines. Symmetry is for those who prefer a sense of order, balance and calm. Symmetrical wall groupings share certain similarities; shape, size, color, or subject content. Formal groupings work well over large furniture, like sofas, tables or fireplaces. Although each photograph is different in the picture on the right, they have many elements in common; photographs are the same size, same black and white, with white matting and frames. The similarities unite the individual pieces into one large rectangular shape. Symmetrical wall groupings are easy to create, because you are simply trying to "match" each side of a room. Asymmetrical home design, or informal balance, gives you a more casual and energetic feeling, preferring horizontal lines over vertical. Informal balance is for those who prefer a bit more excitement and creativity in their home decorating. For asymmetrical wall groupings, combine artwork of different shapes and sizes. Groupings should have at least one characteristic in common; color, subject, or frame style. In the photo on the right, notice the bird theme that unites the group. Asymmetrical wall groupings can be tricky to create. Work out the arrangement on the floor or paper before pounding nails in the wall. Typically, you start with the largest piece first and arrange smaller pieces around it until you achieve a balance you like. Keep asymmetrical arrangements from looking sloppy by avoiding random patterns; stick to squares, circles, and rectangles. If you have two large pictures in your arrangement, hang one higher than the other so they aren't too matchy. With asymmetrical wall groupings, both sides of the arrangement won't look the same, but balance and scale are still important. The easiest paper method for creating a successful wall arrangement is to lay the paper down and trace around the pictures (or mirrors) you plan to use with a pencil. Cut them out and tape to the wall, arranging and rearranging until you find a wall grouping that you like. See the photo on the right. In this method, you'll need to measure and mark for nail holes to make sure you get the spacings perfect between each picture. See the second method for instructions on how to do this. In the same manner as the first method, start by laying a large piece of paper (as big as you plan the arrangement to be) on the floor. This paper will be your template. Arrange your artwork on top of the paper. Start with a large shape in the middle, like a square or rectangle. Fill in the middle section with more art, and finally the edges until you're pleased with the arrangement. You can arrange artwork casually or in more formal shapes like squares, rectangles and circles. When you're satisfied with the arrangement, draw an outline around each piece of art with a pencil or dark pen. To get nail holes in the right spot, measure the distance between the top of the frame and wire (pulled taut) on the back of each piece of art. Mark the spot with a circle, making sure it’s in the center of the frame. If the picture has a saw-tooth hanger instead of a wire, mark that in the same manner. 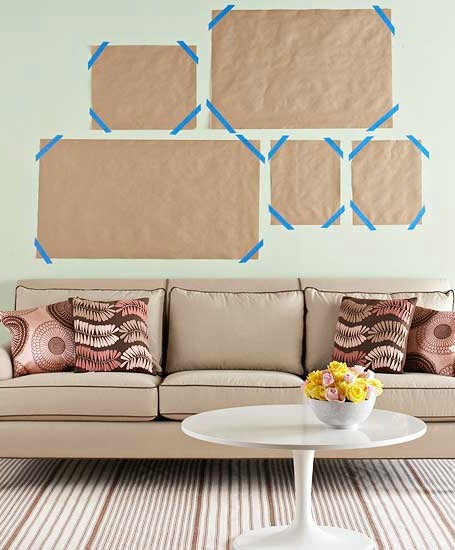 Tape the template to the wall in the desired location. Stand back and assess the arrangement. If you approve, hammer nails in the marked spots on the template, making sure to hang appropriate hooks for the size and weight of the artwork. Gently tear the paper template away from the nails and the wall-- hang the pictures in their designated locations. Below is an informative video from eHow by Anne Myrick, who discusses some of the topics mentioned above. Perfect Picture Wall comes with all the hanging tools you need, except a hammer. See the video demonstration below to learn more about this product. Select the spot where you want to hang your picture or mirror. Hold it against the wall, (remember, the middle should be around 60" high) and draw a tiny pencil line along the top of the frame. Next, measure the distance from the wire (held taut) on back of the picture to the top of the frame. Take this number and measure down from the pencil mark on the wall. Mark this spot-- this is where your hook will go. Nail the hook on the spot. Hang and adjust the picture till it’s straight. For medium and large pictures, consider using two hooks. For small pictures, place the hooks a couple inches apart. For large pictures, space hooks farther apart. The best place to hang a mirror is where it will reflect light from a window with a great view or a sparkling lighting fixture. This will bounce more light around a room creating the illusion of more space. Be careful of what the mirror reflects; you don't want to reflect something undesirable! A mirror above a fireplace usually reflects the ceiling-- not very interesting! 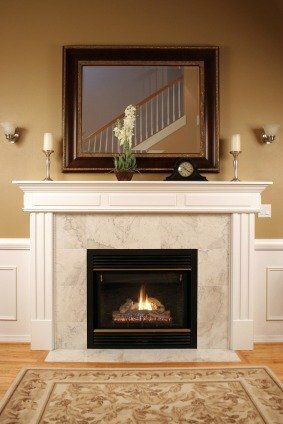 If you create an attractive arrangement on the fireplace mantle, the mirror will reflect the back of that. Make sure the mantle arrangement looks good on both sides. 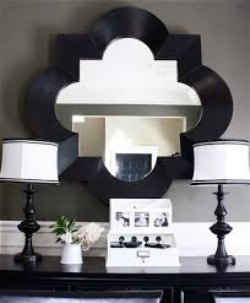 Mirrors can be hung alone or in wall groupings, just like artwork. The same rule of scale and balance for hanging artwork also applies to mirrors. Mirrors can be hung in every room. Small rooms especially benefit from the addition of a mirror, because they add depth to a room by seemingly extending the room through the glass. Just like artwork, the distance between a mirror and the top of a sofa should be 6-12 inches. The distance between a mirror and a tabletop should be about 10-12 inches. Hanging oversized and heavy art is more complicated than putting up smaller pieces. Follow the advice in this instructional video by Pottery Barn. What NOT to do with artwork! Don't hang artwork on every single wall in a room! Leave at least one wall free of art. When home staging, even less. 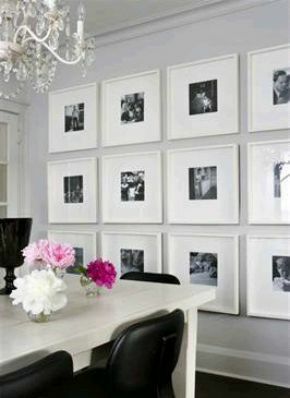 Don't use an assortment of frames that have nothing in common to create groupings. The end result will look cluttered and inharmonious. When hanging triptychs (a panel or picture divided into three individual parts) don't space them too far apart. You will lose sight of the overall painting, instead focusing on the gaps between. Avoid hanging artwork and mirrors any higher than the top of the doorframe, unless the room has really high ceilings. When hanging artwork and mirrors, don't hang them too high. The middle of a picture should measure at 60 inches from the floor. The picture below is a good example of how NOT to hang artwork. The pictures are hung too high and too far apart! The eye doesn't know where to go.